InSequent is proud to power the mobile marketing programs for 5 of the top 10 largest news media companies in the US. Not too many better ways to get local SMBs on your platform than by leveraging the most trusted/and largest sales force in any given local market. Leading mobile solution providers, Brainstorm Mobile Solutions, has compiled a list of 10 must-know marketing buzzwords to keep you up to date with the ever-evolving vocabulary of mobile marketing. (1) Online consumer actions, including likes, shares and comments. (2) Strategies brands use to foster relationships and the resulting analytics. A holistic marketing plan where every piece of information concerning a particular brand is communicated to the target audience through all possible channels. An inclusive term for three big trends: Social media, Local commerce and Mobile apps. Describes content on one device (tablet, smartphone, computer) that provides contextual information for programming. Refers to our ability to collect and analyse the extensive and detail-rich data sets that we are now generating in the world. The ability to harness the ever-expanding amounts of data is completely transforming our ability to understand the world and everything within it. Engaging with consumers on a personal level, brand-to-person e.g. via social networks. Advertisements on a website that look and behave like the site’s content e.g. sponsored stories, posts or premium ads on Facebook or Twitter. Marketing initiatives that are nimble, flexible and allow for real-time changes or adjustments. “Bite-sized” chunks of information that can quickly be consumed by the audience. Often refers to minigraphics – infographics that are very focused on a single piece of data rather than the entire story. Described as “the biggest focus group you could ever imagine,” crowd sourcing provides the opportunity to reach and gather information from a large group of people through the internet – specifically, social media. Ok, I am ready to come clean. I paraphrased the title of my article directly from a quote I read recently. It was so dead on and spoke directly to how I’ve felt for some time now when it comes to the topic of mobile marketing that I just had to “borrow” it. Why do you think I wrote an article last year entitled Mobile Marketing – The Elephant In The Room For Marketers? As I wrote then and will write again here, the fact of the matter is that mobile marketing – despite all it’s continued hype and promise has been severely under utilized by marketers of all shapes and sizes. And I read it in a press release which announced the release of a report entitled Mobile Share Report, the first industry report to investigate the current state of mobile content engagement. BrightEdge tracked the business impact of mobile usage across 6,000 brands and analyzed more than 5 billion web pages to quantify how mobile performs against the traditional desktop in driving conversions. Mobile traffic grew ten times faster than desktop. From H1 2012 to H1 2013, mobile traffic grew 125% while desktop grew a mere 12%. Mobile conversions lag behind tablet and desktop. It’s an even playing field for tablet and desktop, as both have nearly the same conversion rate. Mobile converts at a significantly lower rate: 0.3x desktop and tablet. Video content drives conversions. Mass video consumption within the media and entertainment industry drives mobile conversions at a rate that exceeds desktop conversions: 1.6x. Other industries that convert relatively well on mobile include travel and hospitality at a rate of .7x desktop and eCommerce at a rate of .6x desktop. In terms of which industries are leading the way, according to the report software/technology, financial services and real estate have experienced significant growth in mobile traffic when compared to desktop. After reading the press release I was interested in learning more and me being me – the person who watched entirely too many detective shows growing up, wanted to dig deeper. So I put on my Columbo raincoat and had a conversation with Brad Mattick, VP Marketing & Products at BrightEdge. Steve Olenski: In the report you mention that “Marketers need to do a better job at addressing the user experience on smartphones.” Can you provide some specific things marketers can be doing? Brad Mattick: Today mobile accounts for one out of every three internet usage minutes. This offers a massive opportunity for marketers who learn how to optimize customer mobile experiences to drive conversions. To push mobile from its current high traffic/ low conversion rates, marketers need to invest in a holistic approach. By adopting new methods of measuring activities across all channels — including search, social and mobile — brands can deliver a seamless experience. It’s also essential that marketers leverage big data insights to understand the impact of their activities and eliminate the “spinning wheel syndrome” many brands experience with mobile marketing. Another huge component of mobile success is creating easily digestible, engaging content, like images and video. We have found that the brands that leverage these tactics are ahead of the curve in overcoming the conversion challenge. Olenski: What’s the biggest mistake brands/marketers make when it comes to mobile marketing/advertising? Mattick: Brands and marketers make a huge mistake by releasing content across fragmented channels without implementing a device specific strategy or analytics. For example, we see brands where the mobile experience is a hodgepodge of mobile specific content and desktop content, which provides a challenging user experience. Also many brands lack the ability to measure mobile competitive performance, site structure and performance at scale. Leaders are starting to realize the importance of managing and measuring their content across channels on mobile, but it’s only the more advanced companies who are tying their content back to specific business metrics such as revenue. Olenski: The report touches on the industries that are the most progressive with mobile, but can you elaborate; provide more detail, examples? Mattick: We work with more than 6,000 brands that span dozens of industries, giving us broad visibility into the specific sectors in which mobile is finding the most success. For example, the report reveals that the hospitality and travel industry is several steps head when it comes to mobile. We work with brands like Marriott and Starwood Hotels that have optimized the user experience to align with consumer behavior. If you are traveling, you are likely to be reserving hotel rooms or booking flights on-the-go from your mobile. Delivering content that fits this behavior and that leans more on images and engaging content has bolstered conversions for this industry. Another mobile conversion leader is eCommerce. Brands within this industry thrive by driving revenue through their sites and have optimized mobile to be as user-friendly as the traditional desktop. Some things they are doing differently are optimizing product catalog content and streamlining the purchase process for mobile devices. 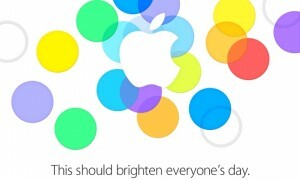 On Tuesday morning, Apple confirmed that it will hold a widely rumored media event next Tuesday, September 10th. The next-generation iPhone will likely be unveiled on that occasion, nearly one year after Apple’s iPhone 5 reached the mobile masses. In recent weeks, supply chain chatter has suggested that the low-cost, entry-level iPhone 5C will also take the stage September 10th. While Apple is yet to confirm the official launch date of the new iPhone(s), most expect the devices to reach consumers on or before September 28th. MMW will bring you complete coverage next Tuesday as the Apple event gets underway.